The price ranges vary from under a hundred dollars to well over a thousand on these small luxury items..
What will be required for mounting a TV under a kitchen upper cabinet? 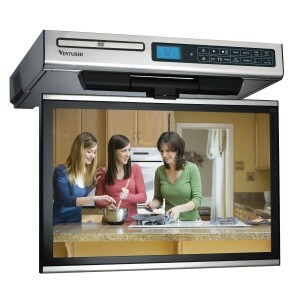 Click here to see undermount TV brands , styles and price ranges of TV/DVD players designed for mounting under kitchen cabinets. Most of the reviews I’ve read about these undermount small TV/DVD combinations are very good.